Ebirah, Horror of the Deep (ゴジラ・エビラ・モスラ　南海の大決闘, Gojira, Ebira, Mosura Nankai no Daikettō, lit. Godzilla, Ebirah, Mothra: Big Duel in the South Seas) is a 1966 Japanese science fiction kaiju film featuring Godzilla, produced and distributed by Toho. The film is directed by Jun Fukuda with special effects by Sadamasa Arikawa, with supervision by Eiji Tsuburaya, and stars Akira Takarada, Kumi Mizuno, Akihiko Hirata and Eisei Amamoto, with Haruo Nakajima as Godzilla and Hiroshi Sekita as Ebirah. It is the seventh film in the Godzilla franchise and in the Shōwa Godzilla series. The film was released to theaters in Japan on December 17, 1966 and directly to television in the United States in 1968 as Godzilla versus the Sea Monster. After Yata (Toru Ibuki) is lost at sea, his brother Ryota (Toru Watanabe) steals a yacht with his two friends and a bank robber. However, the crew runs afoul of the giant lobster Ebirah and washes up on the shore of Letchi Island. There a terrorist organization manufactures heavy water for their purposes; as well as a yellow liquid chemical that keeps Ebirah at bay. The organization, known as the Red Bamboo, has enslaved natives from nearby Infant Island to help them. But the natives hope that Mothra (now a full-grown moth metamorphosized from the larva that appeared in Ghidorah, the Three-Headed Monster) will awaken and rescue them. In their efforts to avoid capture, Ryota and his friends, aided by Daiyo, a beautiful native girl, come across Godzilla sleeping within a cliffside cavern. The group devises a plan to defeat the Red Bamboo and escape from the island. In the process, they awaken Godzilla using a makeshift lightning rod. Godzilla fights Ebirah, but the giant crustacean escapes. Godzilla is then attacked by Ookondoru, a giant condor, and a squadron of Red Bamboo fighter jets, but destroys them both. The humans retrieve the missing Yata and free the enslaved natives as Godzilla begins to destroy the base. Godzilla smashes a tower that has a self-destruct button which will cause the island to be destroyed in a nuclear explosion. Godzilla fights Ebirah and defeats it, ripping off both Ebirah's claws and causing it to retreat into the sea. The natives await for Mothra to save everyone. However, Godzilla challenges Mothra when she gets to the island. Mothra manages to push Godzilla away and carry the people off in a large net. Godzilla escapes from the island just before it explodes. 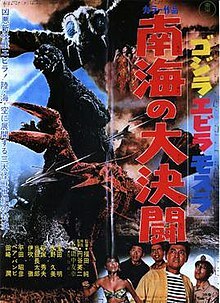 The film was originally written as a King Kong film, titled Operation Robinson Crusoe: King Kong vs. Ebirah, but Rankin/Bass Productions rejected the project; however, Toho proceeded with the project anyway and replaced King Kong with Godzilla (that means that fans missed out on a Kong vs. Mothra fight). Despite the fact that Eiji Tsuburaya was given directorial credit for the special effects, Sadamasa Arikawa actually directed the special effects for the film under the supervision of Tsuburaya, who was busy with his own company, Tsuburaya Productions, at the time. Toho had decided to set the film on an island in order to cut back on special effects costs. Arikawa has cited the film as a frustrating experience, stating, "There were major limitations on the budget from the studio. Toho couldn't have made too many demands about the budget if Mr. Tsuburaya had been in charge. The studio knew I was also doing TV work then, so they must have figured I could produce the movie cheaply." The underwater sequences were filmed on an indoor soundstage where the Godzilla and Ebirah suits were filmed through the glass of a water-filled aquarium, with some scenes of the Godzilla suit shot separately underwater as well. Haruo Nakajima (the suit performer for Godzilla) wore a wet suit under the Godzilla suit for every scene that required him to be in the water, which took a week to complete the water scenes, Nakajima stated, "I worked overtime until about eight o'clock everyday. Even though I wore a wet suit under the costume, I got cold. But I never got sick, because I was so tense during the filming." This is the first of two Godzilla films in which a Pacific island is the primary setting, rather than a location inside Japan (the second, and final, one was Son of Godzilla (1967)). Ebirah, Horror of the Deep was released theatrically in Japan on December 17, 1966 where it was distributed by Toho. The American version of the film was released directly to television by Continental Distributing in 1968. The title was changed to Godzilla versus the Sea Monster, which is what was on television and video prints as of 2008. The film may have received theatrical distribution in the United States as a Walter Reade, Jr. Presentation, but this has not been confirmed. The film was released on DVD on February 8, 2005 by Sony Pictures Home Entertainment. The film was released on Blu-ray on May 6, 2014 by Kraken Releasing. ^ a b c d e f g h i j k l m Galbraith IV 2008, p. 234. ^ Ragone 2007, p. 145. ^ a b Ryfle 1998, p. 356. ^ a b c d Ryfle 1998, p. 136. ^ Ryfle 1998, p. 133. ^ "Godzilla vs. The Sea Monster". DVD Talk. Retrieved 2018-01-29. ^ "Ebirah: Horror of the Deep Blu-ray". Blu-ray.com. Retrieved 17 November 2016. Galbraith IV, Stuart (16 May 2008). The Toho Studios Story: A History and Complete Filmography. Scarecrow Press. ISBN 978-1-4616-7374-3. Ragone, August (2007). Eiji Tsuburaya: Master of Monsters. San Francisco, California: Chronicle Books. ISBN 978-0-8118-6078-9. Ryfle, Steve (1998). Japan's Favorite Mon-Star: The Unauthorized Biography of the Big G. ECW Press. ISBN 1550223488.